When the unmannedmoon probe launched by China today (Oct. 1) arrives at its destination nextweek, it will target a specific zone on the lunar surface to scout out futurelanding sites, the country's state-run media reports. The robotic Chang'e2 spacecraft will take a close look at the moon's Bay of Rainbows, or SinusIridium, which has beenproposed as a potential landing site for China's next moon-bound mission, the XinhuaNews Agency reported today. Chang'e 2will send back high-resolution photos of the region to help mission plannerspick the best landing targets for Chang'e 3 ? the probe that is expected tomake China's first unmanned moon landing in 2013. "Thegeological structure in this area is diverse, so a probe there would havegreater scientific value," Wu Weiren, the chief designer of China's lunar exploration program, told Xinhua. The Bay ofRainbows is approximately 147 miles (236 kilometers) wide. Its coordinatelocation is around 44 degrees north latitude and 31 degrees west longitude. Four or fiveareas have been identified as possible landing grounds for the Chang'e 3spacecraft, Wu said, but the Bay of Rainbows is the current frontrunner, Xinhuareported. "Otherplaces on the moon have already been landed on, so we want to choose one thathas not been explored before," he said. "Previously, most lunarprograms landed around the equator of the moon, an area easier for monitoringand control maneuvers, but Chang'e 3 will take on greater challenges." Chang'e2 launched at 6:59:57 a.m. EDT (1059:57 GMT) from the Xichang Space Centerin southwestern China's Sichuan province, according to state media reports. It shouldtake about five days for the spacecraft to enter orbit around the moon. Aftersnapping the photos, Chang'e 2 will retreat to an altitude of about 62 miles(100 km) to conduct a study of the lunar surface and dirt. 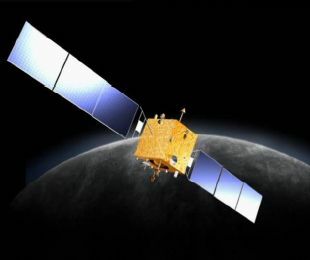 The Chang'e2 mission follows on the success of China's first lunar probe, Chang'e 1, whichlaunched in October 2007 and ended its flight in March 2009. Chang'e1 crashed into the moon after completing its mission. China isalso the third country after Russia and the United States to launch mannedspaceflights. The country has launched three manned space missions using itsShenzhou spacecraft, most recently the Shenzhou 7 flight of 2008. That missionincluded China's first three-person spaceflight and China'sfirst spacewalk.